This amazing halloween decoration is are ideal for hanging in dark corners around your house to spook your unsuspecting guests! 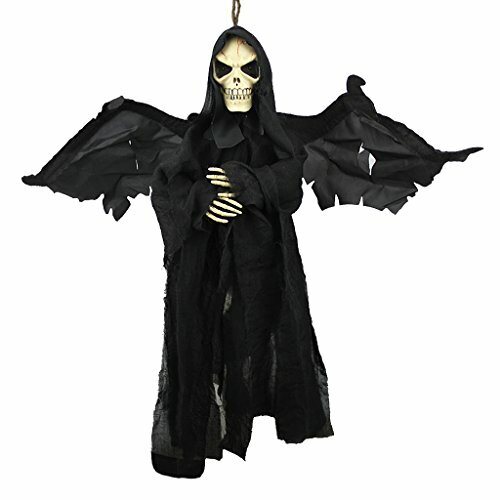 Our animated hanging grim reaper skull wears with A long black/white flowing robe which floats eerily in the Breeze; She features touch-activated noises as well as flashing red eyes. Pose her wings in any positione. Great for greeting trick-or-treaters, or visitors to your haunted house! Hang from a tree, on your porch, or in your living room! If you have any questions about this product by Holiberty, contact us by completing and submitting the form below. If you are looking for a specif part number, please include it with your message.